Come out to see the spectacular flower display in Joshua Tree National Park while the blooms are everywhere. Once in a decade event. See my photos from Palm Sunday weekend. The temperature was in the low 70's. 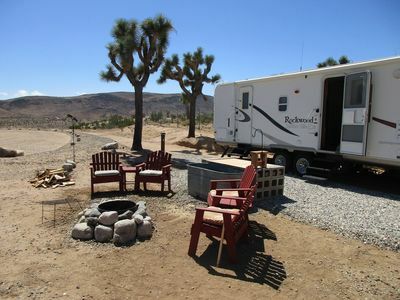 We are conveniently located just a few miles from the popular Joshua Tree National Park Black Rock Campground. 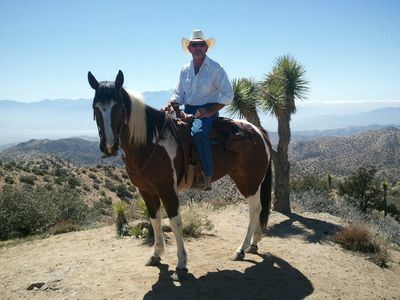 Our home sits among 30 mature Joshua trees (Yucca brevifolia). They were supposedly named because upon seeing them, Mormon settlers were reminded of the biblical story of Joshua reaching his hands for the sky. My favorite parts of this home are the ample space in all the gathering spaces and beautiful mountain views from every room. 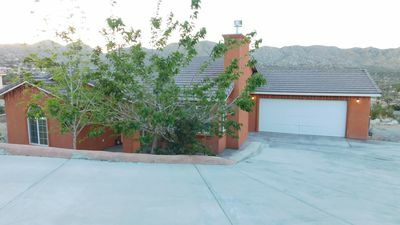 This 3000 square foot home is perfect for large groups and families who need plenty of space to spread out. 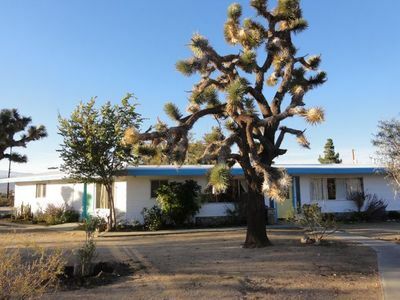 This mid-century home is on an acre plus and includes beautiful indigenous plantings. Because of the unique geographic setting and architecture of the house, there are unobstructed mountain views from every room. 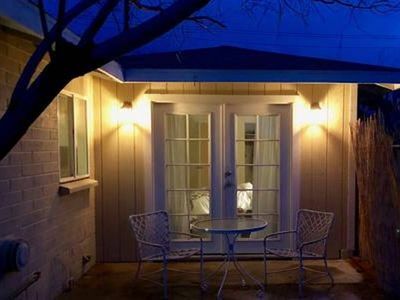 The whole house has been completely remodeled and upgraded making it a magical location, inside and out. Large Joshua Trees and other indigenous trees and bushes surround the home, along with six year old fruit and olive trees that we planted . 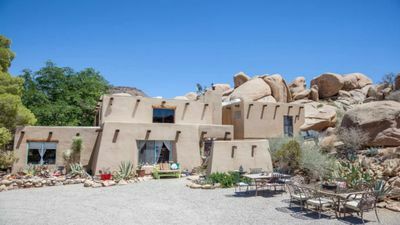 Looking through this desert-lush landscape to the mountains beyond gives you an ever changing palette for your celebrations and festivities, as well as a serene and calming background for quiet times and reflection. 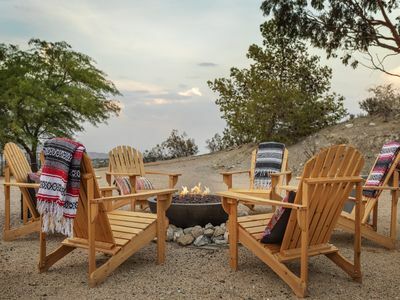 The enclosed veranda (solid roof, screened wall panels and doors) shares our central Flint stone type fireplace and chimney so you can have a nice outside-feeling fire or barbecue with all the comforts of a fully furnished indoor room. 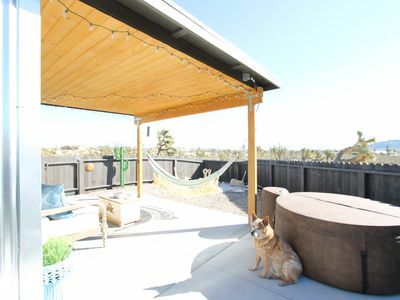 We also provide charcoal grills and a propane grill in the fenced backyard area, perfect for pooches to run around in and chase cottontails, squirrels, and quail. The kitchen includes two full ovens, a microwave, high-end dishwasher and a walk in pantry. We are stocked with plenty of dishes and cookware for easy entertaining. 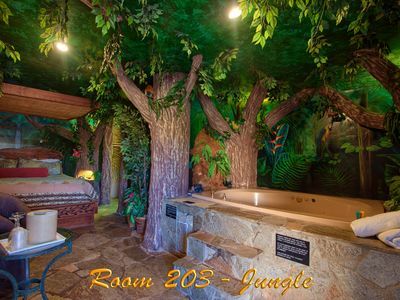 The main house has two bedroom/bath suites and a bonus media room with large flat screen TV. This bonus room provides another sleeping area with a brand new lazy boy queen sofa bed with its own half bath. The large living/dining area has French doors that open into the veranda with a central humongous fireplace. The main house will comfortably sleep up to eight adults, and the guest house will sleep up to four. Each section of the home has its own access and private areas, inside and out. There is also a twin daybed in the veranda that is comfortable weather permitting. In the interest of comfort, safety, and accommodating everyone, there are grab bars in every bathroom and the master suite has a roll in shower, with ramp in and ramp out of the living space. The entire house is one one level and is ADA compliant whenever possible. 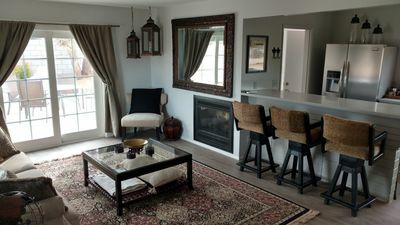 Our remodel included new plumbing, electrical, paint, fresh tile, new appliances, new mattresses and furnishings, TV's in every room and a new HVAC system throughout. The laundry room has a brand new front loading, energy efficient machines, tile counter top and utility sink. 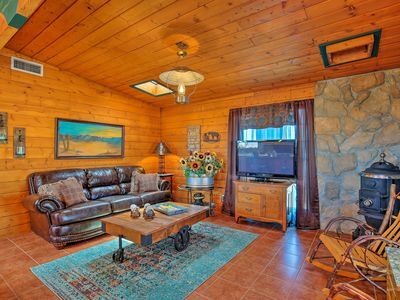 With the goal of outfitting our home with all the comforts of a five star hotel, the master suite has its own mini frig, microwave, and coffee/tea seating area. The brand new king sized pillow top bed is oriented so that you are facing the mountains. Down a small hallway is the media room, with a large new flat screen TV and comfortable seating. 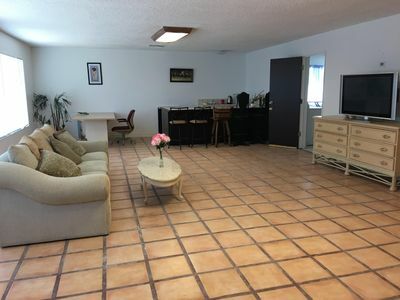 In this media room and in the living room there is a brand new Lazy Boy queen sized sofa bed with an upgraded mattress, and memory foam to make a very comfortable sleeping space. The half bath adjacent to this room makes it a workable option for a couple to use as a bonus bedroom. In the main house the second bedroom suite has its own shower bath and hallway to the outside veranda and living area. From the brand new, top of the line queen sized tempurpedic bed you can see the mountains and watch the fireplace too. 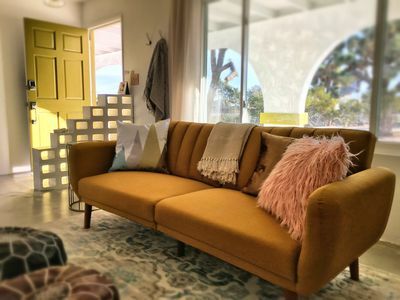 In keeping with the time period of the architecture, the whole house is decorated in a retro/eclectic style, with many artistic touches and conversation pieces to explore. A continuous run of extra large windows along the front of the house brings nature right in to you from the comfort of indoors. In the remodel we tried to be as 'green' as possible, so each space has its own cool/heat unit that can be individually regulated, somewhat like a hotel. 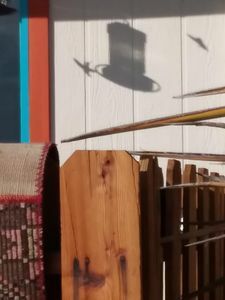 Stay cool while you watch the hummingbirds in the summer sage, stay warm while the mountains are snowy! All of the systems are brand new and remote-controlled. 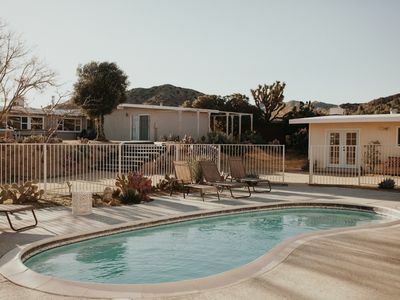 With its central location to all of the best of the Joshua Tree, Morongo Basin and Palm Springs area, The House of Three Wishes is the perfect home base, both for exploring and relaxing. We are adjacent to wild public areas where our dogs run free and so do we. 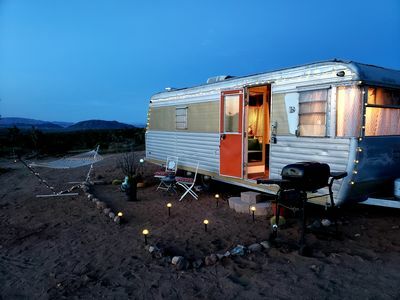 Come discover and enjoy this gem of the high desert! 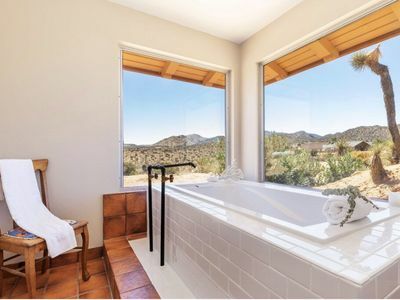 New!Pipes View with phenomenal scenery, relaxing Getaway, close to JT! Rancho Sol y Luna. The little white house at the top of the hill. 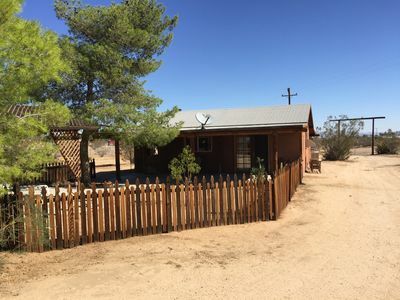 Adorable Joshua Tree Cottage close to monument. 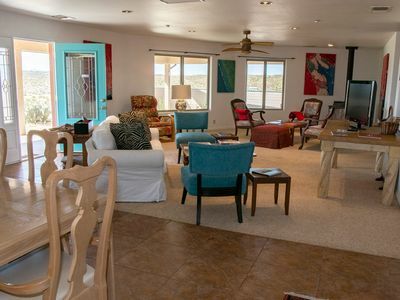 Cactus Moon Retreat - Private Yoga Studio, Private Pool, Fire pit, BBQ and more!